Well I'm off to Boston tommorow for st.Patricks day. I think it'll be a howl. so i did'nt even know about this until some friends said they were going ...hopefully some london based folks will see this and go along tommorow! i had a nice time at the Q+A tonight, thanks to everyone who braved the horrendous wind and rain to make it down to village east for the screening. Its still a kick to see the posters and stuff up in New York! i had a few interviews these past few days here in New York, the Huffingtin post, Washington times and with the esteemed Mr. John Canemaker , as well as with a Vatican newpaper ! 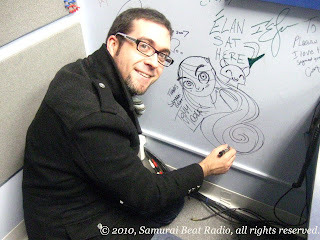 heres a nice radio interview with Samurai Beat Radio - thanks Sara for the interview and I hope your arm heals soon so you can get sketching again! Folks your best bet to get a screening near your area is to contact our US distributor Gkids here in New york or go to the official Secret of Kells US page on Face book . So via Twitter (!) I discovered Kells is playing in Montreal right now. thats cool, hope people there know about it. I did'nt. I went to the Oscar nominated shorts in the IFC here in NY tonight. Some of the "highly commended" ones like Partly Cloudy and Runaway were everybit as good as the nominees. Anyway I peeked in on the Kells screenings and its good to see a healthly crowd at each showing. Thanks New York. I took a picture of the sign before they took the big letters down. Animated clips from Oscar night on Youtube already! Below you can see the bit of original animation we made for the Oscars under extreme time pressure! I would have loved to have had a Viking answer the question of "what does the nomination mean to you?" with a loud "GOOOOOLD!" and then have him trash the place..Big laffs. but we figured this was the biggest audience we'd get to advertise our surprise nomination, so Aisling would be best as shes the cutest character and the one everyone seems to love (along with Pangur ban) the most. We would have liked to have included Brendan but his voice was provided by Evan McQuire almost 4 years ago and Evan has since become a towering strapping young chap with a very deep voice;) Thankfully the talented young Christen Mooney still sounds pretty much like Aisling does in the movie - at least when shes in character! The producer Bill Mechanic asked us to do the piece while we were out for the Annies and the Santa Barbara film festival and Pixar sort of set the template. it was a mad panic to complete this and we were'nt paid anything for it, it was just an amazing oppurtunity to create something for one of the biggest Tv shows in the world . We only had three weeks total to do it too. Paul and I brainstormed the script with Nora over skype the night we got asked to come up with something and we had a few revisions from Bill Mechanic before we got it right, I met up with my friend Jim Capabianco in Santa Barbera at the festival there and ran some of our bad ideas by him until we whittled it down to something do-able! Time was tight so I was doodling ideas directly on the tablet pc with the scratch track provided by Paul Young - sounded pretty weird to have a 35 year old man do Aislings voice but it quickly showed we had too many ideas for the time we had. Nora did a scratch of the lines we settled on and I did a scribbly Flash animatic on the plan from LA to Dublin. I sketched the pose and basic idea in Brown Bag studios in Dublin first thing in the morning when I flew back to Ireland as I knew the time was tight for all involved and the hours I'd have lost getting to KK that morning would have been crucial not to lose. Design wise I made her a little more like how she appears in the short prequel I drew for the French comics. Thanks to Darragh and the lads in BB for their help, without whom I could'nt have got the pose and design off to the talented Allesandra Sorrentino and Alfredo Cassano in time. Our Italian friends animated it in beautiful full, frame by frame style, but in Flash, drawing each drawing directly into the computer with wacoms, the result is pretty much as good if not better than their superb work on paper for the feature itself IMO. Lily Bernard and Maestro Ross Stewart made the BG and the sound studio Piste Rouge in Paris tidied up the sound and did some subtle forest efx. Serge Ume and his team in digital graphics made the Ink and paint and compositing in five days and hey presto , Aisling was ready for the Oscars. It was a great honour to create something original for the actual show and we scrambled to rebuild our international pipeline mainly because every one in our own studio are so busy on other projects right now but also because it was good to work with some of the best talent we had on the movie itself. It was cool also to see the Fantastic Mr.Fox clip mention The Secret of Kells too...almost makes up for not getting to meet Wes Anderson after all. I only saw all the other clips on the night myself, so they were all a lovely surprise. I have to say Pete Docter is the ultimate gentleman and his speech is just lovely to watch again after the clips play when he most deservedly wins the goldy fella. back in the big apple, totally exhausted. sadly lovely liselott had to continue onwards home to Kilkenny tonight. my latest hoard of comics from Meltdown in La. Nice. tommorow looks reasonably busy with press again, its all good and although its a pity not to be back on the old sod until the end of the month, I'll b excited to see NY and Boston around Paddys day. history. The Secret of Kells weekend gross of $39,826 was the best screen average of any film in the nation for the weekend of March 5-7.John Vanco, GM of IFC Center said, "With The Secret of Kells selling out all but one of its weekend shows, IFC had its biggest, Friday, Saturday, Sunday in the theater's history. Saturday was our single biggest day ever and we also had our biggest weekend ever. We're thrilled to be able to extend our mission of showcasing the best of independent film by presenting a wonderful picture like Kells, which gloriously proves that kids and parents are just as starved for quality alternatives to Hollywood product as IFC Center's regular audiences are. "Eric Beckman, President GKIDS said, "We are just thrilled beyond words at the record-breaking reception New York audiences have given to The Secret of Kells, as well as the love the film has received from NY critics. It has been an amazing ride so far, and we now look forward to expanding our release and giving audiences in other markets an opportunity to experience this amazing film." The film will next open in Boston and Philadelphia on March 19th.The film opened to unanimous praise from NY critics, A.O. Scott from the New York Times called it "Extraordinary! ""Critics Pick! Extraordinary! The Secret of Kells discloses strange new vistas that nonetheless seem to have existed since ancient times." - AO Scott, New York Times"A Visual Feast! Unlike anything I have ever seen before!" - Lou Lumenick, New York Post"Rapturous! Stunning! A riot of color!" - Village Voice"Pure Inspiration! One of the most beautiful works of animation ever!" - NY Press"Enchanting!" - Time Out New York"Dazzling! Utterly Charming! A haunting blend of history, fairy tale and pure invention!" - Andrew O'Hehir, SalonMagic, fantasy, and Celtic mythology come together in a riot of color and detail that dazzle the eyes, in this sweeping story about the power of imagination and faith to carry humanity through dark times. Young Brendan lives in the Abbey of Kells, a remote medieval outpost under siege from raiding barbarians. One day a celebrated master illuminator arrives from foreign lands carrying an ancient but unfinished book, brimming with secret wisdom and powers. To help complete the magical book, Brendan has to overcome his deepest fears on a dangerous quest that takes him into the enchanted forest, where mythical creatures hide. It is here that he meets the fairy Aisling, a mysterious young wolf-girl, who helps him along the way. But with the barbarians closing in, will Brendan's determination and artistic vision illuminate the darkness and show that enlightenment is the best fortification against evil? 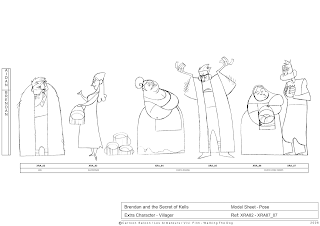 The Secret of Kells is a France/Belgium/Ireland co-production of Les Armateurs, Vivi Film, Cartoon Saloon and France 2 Cinema and features the voices of Brendan Gleeson (Harry Potter, In Bruges), Evan McGuire and Christen Mooney. great night had by all! thanks to everyone who was with us in spirit! woke up early, nervous like Christmas day when i was five years old. Given that you will have so many filmmakers, family and friends in LA for the big day, I have arranged for a reserved area in the recently opened Dillon’s Irish Pub on Hollywood Blvd, which is ¾ mile away from the Kodak Theatre. The upstairs area is held for the entire Irish group so please feel free to invite as many people as you like to view the red carpet and ceremony together on their multiple TVs. The place will get packed early so please ask everyone to get there as close to 3pm (when the red carpet telecast begins) to get a spot. Please note this is not a hosted event, but all bottle and tap beer is $3, house wine $4, so we won’t find a better deal in Hollywood! RTE will be covering this event and hope to conduct interviews with the travelling support, so have your smiles ready for the cameras…. Since the Academy Award for animated features was created in 2001, the category has been dominated by big-budget, computer-animated films from a handful of studios and distributors, mainly meaning Pixar (six nominations and four wins, in eight years), Walt Disney and DreamWorks. There were exceptions -- Hayao Miyazaki's hand-drawn "Spirited Away" won in 2002, and Nick Park's stop-motion "Wallace & Gromit: The Curse of the Were-Rabbit" in 2005 -- but those almost seemed to underscore the wider world of innovative animation Oscar was ignoring. Over the last several Oscar seasons, the roster of nominated films has seemed so predictable and unadventurous that some commentators have suggested abolishing the category. Nobody's saying that this year. While Pixar's "Up" (also nominated for best picture) is considered the likely winner, it's definitely nothing like a formulaic kid-flick -- and it's also the only computer-animated film among the five nominees. 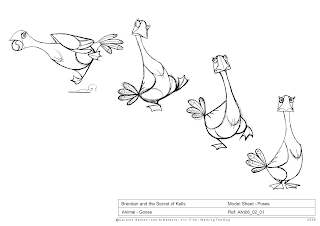 After more than a decade of CGI dominance, handmade is suddenly all the rage: Even Disney's nominated "The Princess and the Frog" was hand-drawn, as if in a deliberate effort to suggest that company's great tradition. Nominees also include two stop-motion literary adaptations aimed at a kidult crossover audience, Henry Selick's "Coraline" and Wes Anderson's "Fantastic Mr. Fox." But those movies had all been widely seen, favorably reviewed and discussed as possible Oscar fodder. Nobody, and I mean absolutely nobody, was prepared for the nomination of "The Secret of Kells," a dazzling, not to mention utterly charming, hand-drawn fable about a 12-year-old boy's adventures in early medieval Ireland. "We thought we might be in line for some Irish and European awards, and that would be that," says director Tomm Moore. "The Oscars? No way. That never entered my mind." American distribution rights for "The Secret of Kells" belong to GKIDS, an independent producer and distributor of children's entertainment whose main property is the New York International Children's Film Festival. To its credit, the company responded to the unexpected Oscar nomination by pushing the film into one New York theater this weekend, with wider release and a DVD version soon to follow. I had hoped to meet Tomm Moore in person during his New York visit, but both of us were snowed in after the recent blizzard and decided to talk on the phone instead. It's such a wonderful idea for an animated film, but also a pretty unlikely one. Tell me how and when you came up with it. I had an idea along these lines when I was in college in '99, and I started to develop it with a group of friends -- the idea of trying to translate Irish art, Celtic art, into animation. To do something along the lines of, say, what they did in "Mulan" with Chinese art. After I got out of college we set up an animation studio in Kilkenny and we were doing commercials and other kinds of jobs. So this was a pet project we could never get off the ground until 2005, when we met the producers of "Triplets of Belleville" [the French-Belgian animated feature, Oscar-nominated in 2003]. We were able to put the financing together and work on a final script. We had many years of development prior to that, in terms of the art style. But in 2005 we were finally able to hit the ground running. Talk about the art style. Obviously you drew on the Book of Kells itself. Was there other medieval art, or art from other periods, that you looked at? At a certain point it was the Book of Kells itself, and then we started looking at medieval art in general, the triptychs and other things. Basically anything in and around that whole era -- European medieval art and also anything involving indigenous folk art that had been translated into animation. We looked at, like, the Hungarian folk-tale series that had been done in Eastern Europe, where they had taken Hungarian art and animated that. Or American things like "Samurai Jack," where they'd taken Japanese and other indigenous art and adapted it into TV animation. We took all of that as reference points, and tried to come up with our own style. I know this is a work of fiction, not history. But how much research did you do? Did you want to paint something close to an accurate portrait of that era? We started off with a fairly dry version of the story, which was even a little bit too historical. Then we started working with a screenwriter named Fabrice Ziolkowski, this French-American guy, and he helped us tease out more of the hero's-journey story. That opened it up to allow us to bring in some of the legends and fantasy that surrounded the history, which might have made the story skew a little bit younger, and also made it a bit more fun for the animators doing it. Telling the story through this young boy, who's a kid but also a monk -- or, I guess, a student monk -- was an interesting choice. We were always telling the story through Brendan's eyes, but I think I was looking too much at Aidan and the Abbot in the first draft of the script. Seeing the world through Brendan's eyes is much more interesting. Imagine the suggested world of a kid in the Middle Ages who's never been outside the walls of this abbey -- that gave us another way of looking at the whole movie. So he became central rather than secondary. Was the Abbey of Kells really this kind of fortified bulwark, the way you portray it? Is that part historical? Yeah, basically it is. The land was given to Cellach, who was a historical character, by a local nobleman. Iona had been burned out and sacked so often that they decided to come into the center of Ireland [County Meath, roughly 40 miles north of Dublin] and try to get away from the Vikings. Of course the Vikings just came up the rivers and wound up sacking Kells in the end anyway. Maybe the walls weren't that big! We exaggerated that a bit, now. It's fascinating that you depict the monks at Kells as being not just Irish, or not even principally Irish, but as coming from all over the world -- Italy, Africa, the Middle East. What's the historical basis for that? Well, this is what we found most interesting and surprising when we did research into the Book of Kells. One of the things they don't understand is that there are inks and patterns and designs in the Book of Kells that come from all over the world. There's some ink that seems to have come from Afghanistan; there are patterns they've linked to Morocco. It's fascinating stuff: They've found bones of pet monkeys, things like that. Stuff we didn't even use in the movie. There was a lot of trade and interaction, a lot of people coming to Ireland from mainland Europe for refuge. Maybe it was all down to trade and dialogue, and maybe there were all sorts of people from all over the world living in Ireland at the time. We thought it was a nice reflection of how cosmopolitan Irish society has become today. Right. As you and I both know, Ireland in the 20th century was, at least at times, a pretty provincial place, somewhat cut off from the world. I grew up in an Ireland where basically all my friends were Irish people with good Irish names, all of that. My son now goes to an Irish-speaking school where he's got friends from Burma, Poland, you know, everywhere. So I thought it was interesting to see that in the Middle Ages Ireland had an influx of people from everywhere, which parallels what's been going on just in the last 10 years. Wait -- your son goes to school with Burmese and Polish kids who are learning Irish? That's fantastic! I wish my dad, who was a Celtic scholar, was still around to see that. It seems like you're trying to address the old-style Irish nationalist stereotype, the idea that there was some pure culture that had been handed down from ancient times. Ah, no. We're a mongrel breed and that's for sure. A lot of Irish people are surprised by how rich a cultural history we had around that time. Talk about the way you use the pagan and pre-Christian iconography in the movie, especially the ancient Celtic god Crom Cruach, whose image was supposedly destroyed by St. Patrick. What I found most interesting about that period -- I've done a couple of graphic novels about St. Patrick, and what I really learned was how the ancient Celtic gods had been transmuted into the new Christian pantheon. A lot of the saints, like St. Colum Cille, had all these amazing legends around them: His hand glowed, so he could write at night! All this strange stuff. It would always be this confluence of the old pagan beliefs and the more modern -- well, not modern -- but the newer Christian stuff. I found that the Crom Cruach story seemed to be linked to this old duality, with Lugh as the sun god and Crom as the god of the underworld. There were all these legends about human sacrifices that St. Patrick stopped by defeating Crom Cruach. I sort of thought, maybe that's where the idea of the snakes being driven out of Ireland came from, St Patrick defeating Crom. Even though Crom is most often represented as a worm or a giant, a giant idol, we picked on serpent. We thought there was symbolism we could use from the Book of Kells, where they have all these Ouroboros, these snakes eating their own tails, going around the pages. So we thought, let's make Crom into something Brendan imagines after seeing some of the Book of Kells. And then there's Aisling, your little forest sprite. Where does she come from? I don't know if you know much Gaelic, but Aisling means "dream," and there's this tradition of Aisling poems, more from the Celtic Revival period, you know, the William Butler Yeats era. They used to write these poems where Aisling would be a girl the poet would see, who would tell tales about Ireland's woe or whatever. We thought it would be fun to make her a little girl rather than a woman, make her this symbol of the matriarchy that Christianity was replacing, but also something like a little sister to Brendan. I based her on my own little sister, you know? She's always trying to best him, and she's got all these powers. Because she's a fairy she can transform into any creature. She's kind of a mixture of this wise old pagan deity and a pesky little sister. Tell me a little bit about the techniques and technology you used. This is all hand-drawn animation, or mostly? The animation is 95 percent hand-drawn. We did 20 minutes of animation in Kilkenny, and that was the lead for all the other studios. In Belgium they colored all the characters on the computer, and we did some CG, like the Crom Cruach sequence and the Viking attacks. We had to use CG for the crowd scenes, but we tried to make it all look hand-made, keep it looking like medieval art. That was the goal. Surprisingly, you're up against another hand-drawn animation ["The Princess and the Frog"] and two stop-motion films, along with "Up." It's amazing to me. When we started making this movie in 2005, hand-drawn animation was basically dead, except in Japan. It's a mad year to be in the Oscars. Basically we're all in the shadow of "Up," which I think is a great movie. We kind of won big just by getting this nomination. We never thought that could happen. 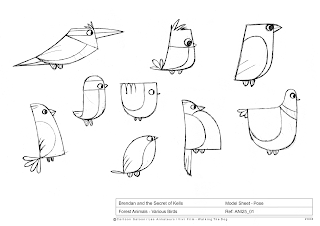 "The Secret of Kells" opens March 5 at the IFC Center in New York, with other cities to follow.